Aqsa Mahmood, Tumblr page, accessed September 10, 2015, http://fa-tubalilghuraba.tumblr.com/. British authorities suspect that Mahmood used social media to help radicalize British teenagers Shamima Begum, Khadiza Sultana, and Amira Abase, who left their homes for ISIS-held territory in February 2015.Atika Shubert and Bharati Naik, “CNN exclusive: From Glasgow girl to ‘bedroom radical’ and ISIS bride,” CNN, September 5, 2014, http://www.cnn.com/2014/09/05/world/europe/isis-bride-glasgow-scotland/. Mahmood is also suspected of holding a senior role in the all-female al-Khannssaa Brigade in Raqqa, Syria, which is reportedly responsible for enforcing female moral behavior.Gavin Madley, “Heartbroken and hopeless: Parents of Scottish jihadi bride Aqsa Mahmood tell of their devastation at losing her to ISIS brainwashing,” Daily Mail (London), February 21, 2016, http://www.dailymail.co.uk/news/article-3457741/Heartbroken-hopeless-Parents-Scottish-jihadi-bride-Aqsa-Mahmood-tell-devastation-losing-ISIS-brainwashing.html. Mahmood was raised in an affluent neighborhood in Glasgow and attended a private school.Atika Shubert and Bharati Naik, “CNN exclusive: From Glasgow girl to ‘bedroom radical’ and ISIS bride,” CNN, September 5, 2014, http://www.cnn.com/2014/09/05/world/europe/isis-bride-glasgow-scotland/. According to her family, she read the Harry Potter series and listened to the British band Coldplay.Atika Shubert and Bharati Naik, “CNN exclusive: From Glasgow girl to ‘bedroom radical’ and ISIS bride,” CNN, September 5, 2014, http://www.cnn.com/2014/09/05/world/europe/isis-bride-glasgow-scotland/. At the start of the Syrian civil war in 2011, however, Mahmood grew more religious and stopped listening to music, according to her parents. Mahmood dropped out of Glasgow Caledonian University,“PM's Extremism Taskforce: tackling extremism in universities and colleges top of the agenda,” U.K. Home Office, September 17, 2015, https://www.gov.uk/government/news/pms-extremism-taskforce-tackling-extremism-in-universities-and-colleges-top-of-the-agenda. and left home in November 2013. A few days after her departure, Mahmood called her family from Turkey and told them she was about to cross into Syria. The family’s lawyer, Aamer Anwar, referred to Mahmood as a “bedroom radical” who had “the best education money could buy,” but was radicalized online.Atika Shubert and Bharati Naik, “CNN exclusive: From Glasgow girl to ‘bedroom radical’ and ISIS bride,” CNN, September 5, 2014, http://www.cnn.com/2014/09/05/world/europe/isis-bride-glasgow-scotland/. During a September 5, 2015, interview with CNN, Mahmood’s parents pleaded for their daughter to return home.Atika Shubert and Bharati Naik, “CNN exclusive: From Glasgow girl to ‘bedroom radical’ and ISIS bride,” CNN, September 5, 2014, http://www.cnn.com/2014/09/05/world/europe/isis-bride-glasgow-scotland/. Mahmood was radicalized online by British citizen Adeel Ulhaq, according to Mahmood’s parents. Ulhaq was imprisoned in February 2016 for facilitating the travel of a British teenage boy to ISIS-controlled territory.Steven Morris, “Three men found guilty of helping teenage jihadi travel from UK to Syria,” Guardian (London), February 10, 2016, https://www.theguardian.com/uk-news/2016/feb/10/kristen-brekke-adeel-ulhaq-forhad-rahman-guilty-aseel-muthana-syria-isis. The Mahmoods described their daughter as a “model child” swayed by Ulhaq’s promises of marriage. Aqsa Mahmood and Ulhaq met with their families at an English mosque in 2013 and told them of their plans to marry. It was the first time the two had met in person.Gavin Madley, “Heartbroken and hopeless: Parents of Scottish jihadi bride Aqsa Mahmood tell of their devastation at losing her to ISIS brainwashing,” Daily Mail (London), February 21, 2016, http://www.dailymail.co.uk/news/article-3457741/Heartbroken-hopeless-Parents-Scottish-jihadi-bride-Aqsa-Mahmood-tell-devastation-losing-ISIS-brainwashing.html. 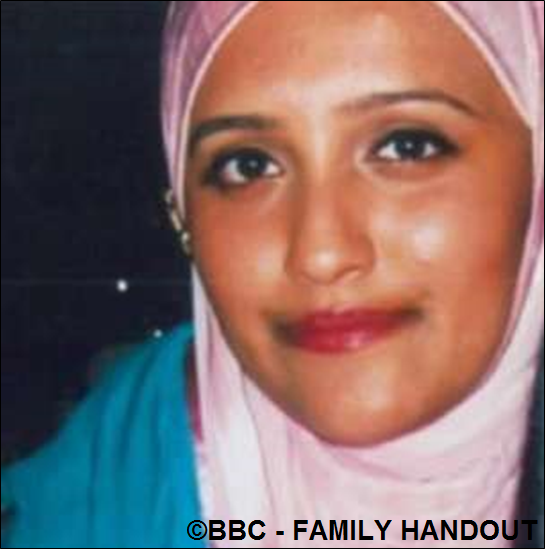 During his trial, Ulhaq reportedly said he had intended to go marry Mahmood, but that she had left for Syria before they could complete their nuptials.Gavin Madley, “Heartbroken and hopeless: Parents of Scottish jihadi bride Aqsa Mahmood tell of their devastation at losing her to ISIS brainwashing,” Daily Mail (London), February 21, 2016, http://www.dailymail.co.uk/news/article-3457741/Heartbroken-hopeless-Parents-Scottish-jihadi-bride-Aqsa-Mahmood-tell-devastation-losing-ISIS-brainwashing.html. Mahmood has used social media to promote life under ISIS. On Twitter, Mahmood has called for terror attacks against her homeland and for British Muslims to join ISIS.Lizzie Dearden, “The Glasgow teenager who dropped out of university to marry an ISIS fighter in Syria,” Independent (London), September 2, 2014, http://www.independent.co.uk/news/uk/crime/the-glasgow-teenager-who-dropped-out-of-university-to-marry-an-isis-fighter-in-syria-9706610.html. In January 2013, before she left Scotland, Mahmood started a Tumblr account on which she posted quotes by prominent jihadists such as Anwar al-Awlaki, Australian preacher Musa Cerantonio, and Osama bin Laden.Aqsa Mahmood, Tumblr page, accessed September 10, 2015, http://fa-tubalilghuraba.tumblr.com/. After leaving home, Mahmood used her Tumblr blog to dispense advice on making hijrah (migration) to ISIS-held territory, as well as to share poetry and extremist religious quotes. Mahmood posted a poem to her Tumblr on April 9, 2014, in which she apologized to her mother for leaving. She wrote, “I know you’ve accepted that I’m never coming back.”Aqsa Mahmood, Tumblr post, April 9, 2014, http://fa-tubalilghuraba.tumblr.com/post/82208918735/ya-umee. In September 2014, Mahmood’s father told journalists that he had stopped reading his daughter’s blog because it hurt him. At one point, Mahmood sent her father a message saying that she prayed every day to become a martyr.Atika Shubert and Bharati Naik, “CNN exclusive: From Glasgow girl to ‘bedroom radical’ and ISIS bride,” CNN, September 5, 2014, http://www.cnn.com/2014/09/05/world/europe/isis-bride-glasgow-scotland/. After Mahmood posted a poem online on June 28, 2015, praising recent attacks in Tunisia, France, and Kuwait, her family issued a media statement dissuading young people from joining ISIS. The statement read: “There is no honour, no glory, no god at work in the cowardly massacre of holidaymakers, people at prayer in a Shia mosque or an innocent man at his place of work.” The family described Mahmood’s words as “twisted and evil,” and said she is no longer the daughter they raised.“Family of Aqsa Mahmood ‘sickened’ by Tunisia blog post,” BBC News, June 29, 2015, http://www.bbc.com/news/uk-scotland-glasgow-west-33316076; Aqsa Mahmood, Tumblr post, June 28, 2015, http://fa-tubalilghuraba.tumblr.com/post/122667412344/black-friday. @UmmLayth_Atika Shubert and Bharati Naik, “CNN exclusive: From Glasgow girl to ‘bedroom radical’ and ISIS bride,” CNN, September 5, 2014, http://www.cnn.com/2014/09/05/world/europe/isis-bride-glasgow-scotland/. Umm LaythAqsa Mahmood, Tumblr page, accessed September 10, 2015, http://fa-tubalilghuraba.tumblr.com/. Place of Birth Glasgow, Scotland, U.K. The U.N. Security Council added Aqsa Mahmood to its Al-Qaida Sanctions List on September 28, 2015.“Security Council Al-Qaida Sanctions Committee Adds Names of Four Individuals to Its Sanctions List,” United Nations, September 28, 2015, http://www.un.org/press/en/2015/sc12059.doc.htm. The U.S. Department of the Treasury designated Aqsa Mahmood as a Specially Designated Global Terrorist under Executive Order 13224.“Treasury Sanctions Major Islamic State of Iraq and the Levant Leaders, Financial Figures, Facilitators, and Supporters,” U.S. Department of the Treasury, September 29, 2015, https://www.treasury.gov/press-center/press-releases/Pages/jl0188.aspx. Aqsa Mahmood is a Scottish propagandist and recruiter for ISIS. “Whoever carries out an individual operation (in USA/UK/FRANCE etc) against any country that is openly waging a war against Muslims and oppressing them.” (Tweet)Lizzie Dearden, “The Glasgow teenager who dropped out of university to marry an ISIS fighter in Syria,” Independent (London), September 2, 2014, http://www.independent.co.uk/news/uk/crime/the-glasgow-teenager-who-dropped-out-of-university-to-marry-an-isis-fighter-in-syria-9706610.html. “Know this Cameron/Obama, you and your countries will be beneath our feet and your Kufr will be destroyed, this is a promise from Allah swt that we have no doubt over. If not you then your grandchildren or their grandchildren. But worry not, somewhere along the line your blood will be spilled by our cubs in Dawlah.” (Tumblr post)Aqsa Mahmood, Tumblr post, September 11, 2014, http://fa-tubalilghuraba.tumblr.com/post/97208872879/diary-of-a-muhajirah-3. “Revenge. This is an answer to our imprisonment, they try to make us deaf, dumb and blind to the light of Allaah, but it will always outshine. Kuwait, France and Tunisia is where they reside. They left a mark which will always remain. Permanent and blunt.” (Tumblr post)Aqsa Mahmood, Tumblr post, June 28, 2015, http://fa-tubalilghuraba.tumblr.com/post/122667412344/black-friday. “And to those who are able and can still make your way, please ittaqillah and don’t delay anymore, hasten hasten hasten to our lands and live in izzah before it is made difficult for you. Know that these trialing times and do not miss out on any of the ajr. This is a war against Islam and it is know that either ‘youre with them or with us’. So pick a side…” (Tumblr post)Aqsa Mahmood, Tumblr post, September 11, 2014, http://fa-tubalilghuraba.tumblr.com/post/97208872879/diary-of-a-muhajirah-3. “So our answer to our passports being confiscated? Wow wallahiil Adheeem biggest joke of this week. The only time we will ever, ever return to those lands beithnillah is to raise our flag. My allegiance is and will only be to our beloved Ameer, destroyer of the enemies, Abu Bakr al Baghdadi (ha) and to the Islamic State.” (Tumblr post)Aqsa Mahmood, Tumblr post, September 11, 2014, http://fa-tubalilghuraba.tumblr.com/post/97208872879/diary-of-a-muhajirah-3. “Read up on your History, and know that it will repeat itself, you will pay jizyah [tax that non-Muslims must pay under sharia law] to us just like you did in the past. This Islamic Empire shall be known and feared world wide and we will follow none other than the Law of the one and the only Ilah!” (Tumblr post)Aqsa Mahmood, Tumblr post, September 11, 2014, http://fa-tubalilghuraba.tumblr.com/post/97208872879/diary-of-a-muhajirah-3. “Hijrah is not just for Jihad but also with the intention of living honourably under the law of Shariah.” (Tumblr post)Aqsa Mahmood, Tumblr post, April 9, 2014, http://fa-tubalilghuraba.tumblr.com/post/82181535227/diary-of-a-muhajirah. “I urge all my sisters to come and gain true honour by living under the law of Shariah, by marrying a brother who puts Allah before his desires and be being in the forefront of this Islamic revival. Wallahi there is nothing more sad than sitting in the sidelines.” (Tumblr post)Aqsa Mahmood, Tumblr post, April 9, 2014, http://fa-tubalilghuraba.tumblr.com/post/82181535227/diary-of-a-muhajirah. “[M]ay Allāh make us amongst those who help to raise the Al-‘Iqaaba (The Black Flag) & not amongst those who stayed back home criticising.” (Tumblr post)Aqsa Mahmood, Tumblr post, October 27, 2013, http://fa-tubalilghuraba.tumblr.com/post/65236293776/may-all%C4%81h-%EF%B7%BB-make-us-amongst-those-who-help-to. “If you are still living in this Disneyland that we should have ‘one Ummah’ with Shiaas then I really do find you disgraceful. Saying that is like an insult to the 9,4000 deaths of Ahlul Sunnah in Syria. And I’m not sorry if that offends any of youse, it’s just the reality. Take it or leave it.” (Tumblr post)Aqsa Mahmood, Tumblr post, May 15, 2013, http://fa-tubalilghuraba.tumblr.com/post/50487543860/if-you-are-still-living-in-this-disneyland-that-we.